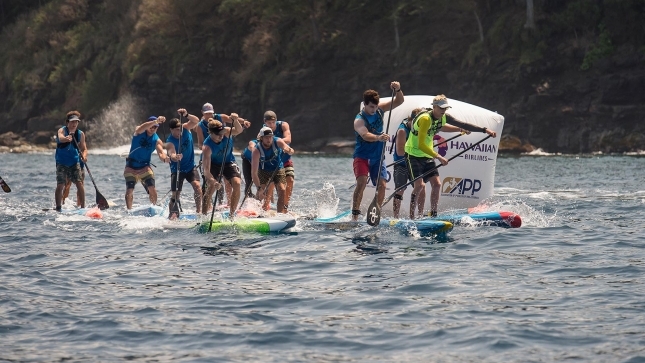 Despite the relatively flat conditions, there was just enough texture on the water to break up any draft trains, with Boothy powering away from the field early and crossing the line about a minute clear of Connor Baxter. Mo Freitas was another minute further adrift in a strong performance that saw him claim the overall event crown and move to to number three on the world rankings. Following a disappointing exit in the early rounds of yesterday’s beach race, which included some tense rail-bumping with team mate Leo Nika that resulted in a super lap sprint off to resolve the dispute, Boothy was clearly fired up to show he’s the fastest paddler in the world when the conditions are taken out of the equation and it all comes down to raw power. After claiming a string of major distance race wins last year, including the Lost Mills, PPGs and ISA Worlds, the current world number two started favourite today after the trade winds died and the locals lost their natural downwind advantage; this is actually the first time in six years that Connor has lost a race on the Maliko run (though in fairness it was anything but a Maliko run). Despite paddling in unfamiliar home ground conditions Connor wasn’t too far behind the Aussie powerhouse, with the world number one staying within sight of Boothy all day but showing his Starboard team mate will be hard to match in the long/flat races once again this season. Mo capped a big weekend with another top three finish, coming home a minute behind Connor but well ahead of many of the world’s best to prove that he can mix it in all conditions. 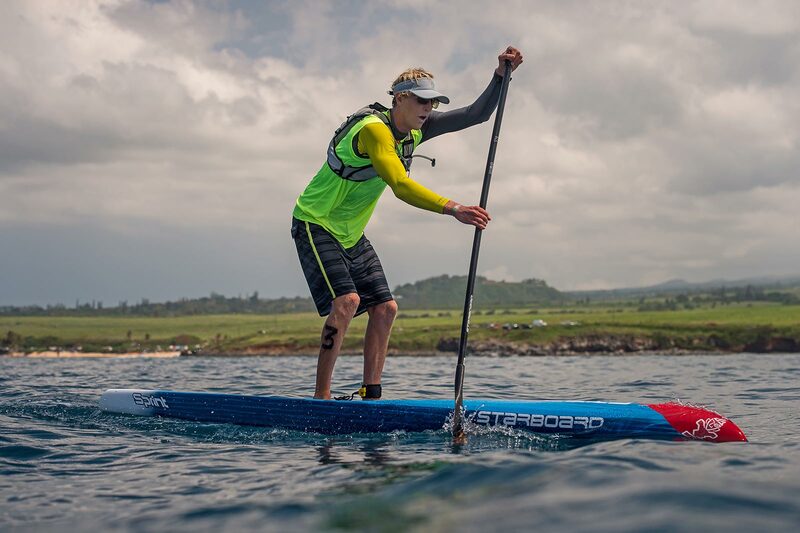 With a runner-up finish in yesterday’s beach race, Mo takes the overall Maui Pro-Am event title from his good friend after the two were split on points (Mo and Connor each had a 2nd and a 3rd; the tie-breaker was the beach race result). Mo’s heroics see him leapfrog Kai, Titou and Travis on the top 100 leaderboard. It was another very impressive showing by the highly under-rated Aussie Lincoln Dews from Team JM, who mirrored his 4th place in yesterday’s beach race after outlasting fellow Aussie and world number three Travis Grant this afternoon. Another highly under-rated athlete in Josh Riccio came home in 6th place after narrowly edging out Saturday’s beach race champ Casper Steinfath. While Casper was unstoppable yesterday, the Danish Viking was always going to have his work cut out for him in the longer race against the likes of Boothy and Connor. Seventh place was a respectable showing for Casper considering the conditions and level of competition, and it ensured he remained on the event podium after besting Lincoln in an overall tie-breaker. 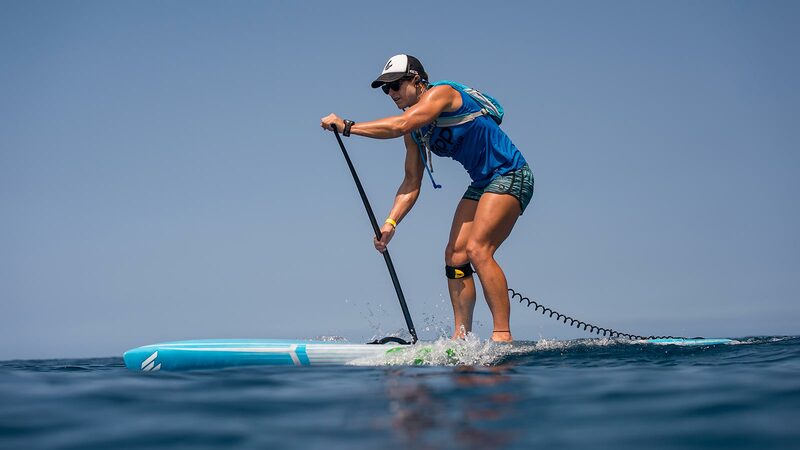 On the women’s side it was a dominant display from Sonni Hönscheid, who took the win from Starboard team mate Fiona Wylde to give the blue boards a 1-2 finish in both the men’s and women’s distance races. But with her third place today, Aussie journeywoman Terrene Black takes the overall Maui Pro-Am event title and arguably the biggest win of her career, defeating three of the world’s top-four ranked women to claim the crown after a hugely consistent weekend. Terrene took out yesterday’s beach race ahead of Fiona and local young gun Annie Reickert before backing it up with a top three finish in today’s grind-fest; the humble Aussie edged out Fiona on the overall standings by a single point (1st/3rd for Terrene vs. 3rd/2nd for Fiona). Sonni will be relieved to come away with the race win today after a surprisingly poor result yesterday. 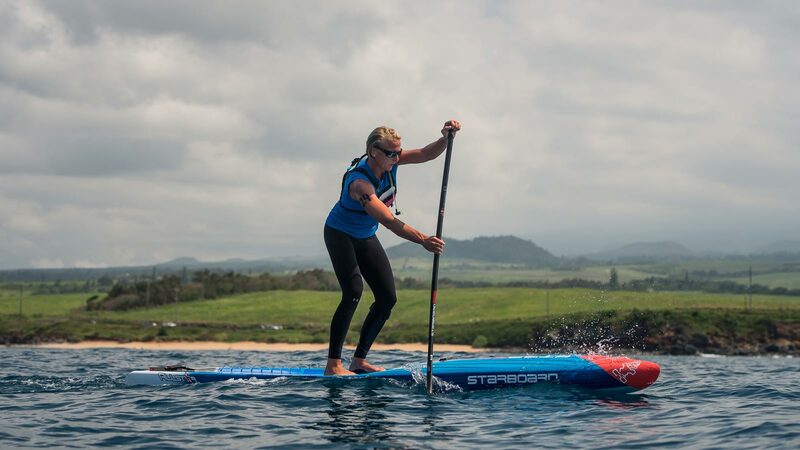 The German powerhouse, who switched to Team Starboard in the off-season, looked out of sorts in the waves despite the fact she’s a highly accomplished surfer. But racing in her adopted backyard and on a very familiar course – Sonni has been visiting Maui every year since she was a kid and is the reigning OluKai champion – the world number three was simply too good for the other women, powering away to win by a clear margin. The Maui Pro-Am was the first racing stop of the 2017 APP Tour, a rebranded and revamped version of the old Stand Up World Series. With a very strong lineup of talent on board this year, the APP Tour is set to have a big impact on the Season 2017 standings alongside The Majors, the Euro Tour and the Regional Majors. The next APP event is Japan in May, followed by races in Germany, New York, San Fran and China. Check out the official site for more. 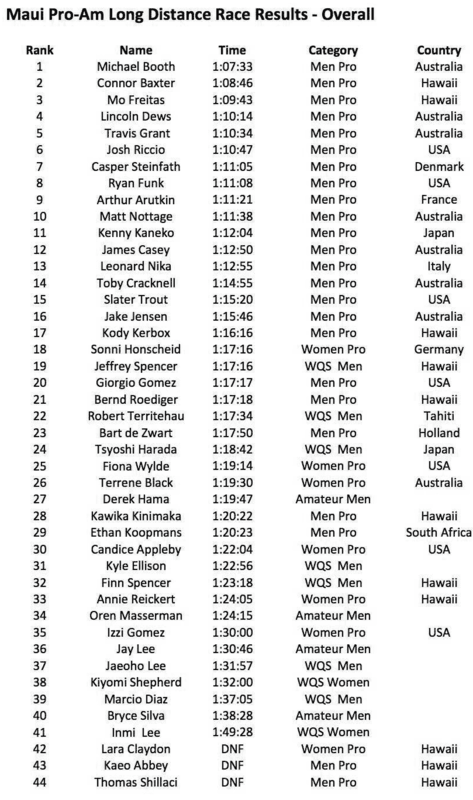 Official results haven’t been released yet, but here are the top finishers I quickly jotted down watching the Facebook Live stream. As soon as the official results are out we’ll post the overall placings (and update the World Rankings). UPDATE: We got our hands on the official results–see below. The World Rankings have also been updated. 26 Thomas Shillaci 27 27 DNS 54 2.81 ? ? 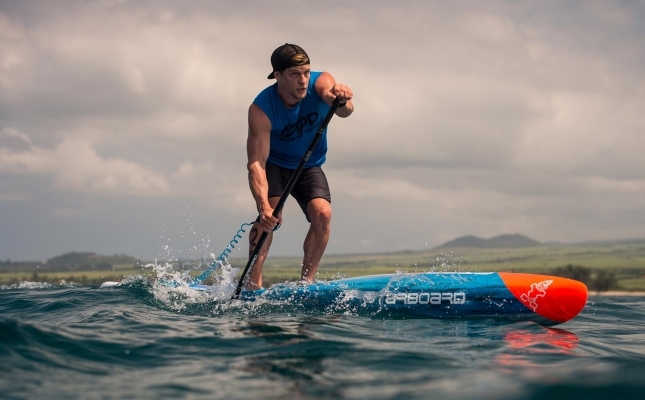 In brief: Casper Steinfath and Terrene Black have taken out the beach race sprints on day one of the 5-star Maui Pro-Am, the first racing event of the 2017 APP Tour, with a highly competitive lineup of international athletes enjoying perfect conditions at the iconic surf break of Ho’okipa. Casper edged out Mo Freitas in the final, while Connor Baxter, Lincoln Dews, Toby Cracknell, Arthur Arutkin, Travis Grant and Kody Kerbox all enjoyed strong performances that saw them reach the final. Despite the impressive lineup of names, the Danish Viking clearly looked the best all day, hammering off the line to take the lead in every round before repeating his signature fast start in the final. However it almost came unstuck at the last moment, with Casper falling at the final buoy and opening the door for Mo before regaining his composure and surfing clear for the win. While there were only 26 starters in the field, almost every guy on the start line was a world-ranked athlete (the men’s event will score 54% on the Race Index), which meant the competition was fierce and there were no easy rounds. 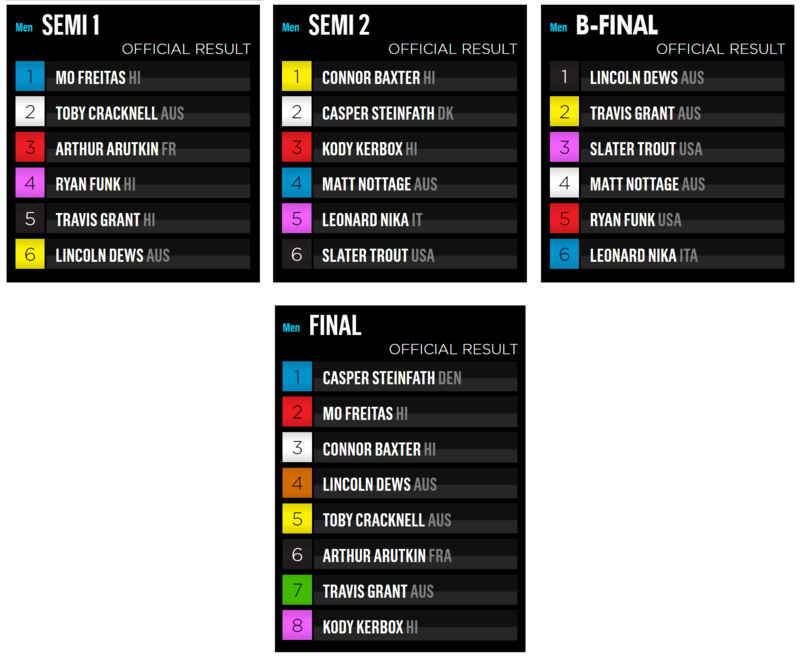 Some very big names were knocked out before the semis, with the likes of world number two Michael Booth and fellow Aussie world-beaters James Casey, Matt Nottage and Jake Jensen all exiting early. While the men’s competition saw a knock-out format, the smaller women’s field was a three-round/overall points affair. With superstars Candice Appleby and Sonni Hönscheid having bad days at the office, Terrene’s biggest competition was defending event champ Fiona Wylde as the pair traded wins in the first two encounters. So with the two front-runners tied on points heading into the third and final round it meant whoever finished ahead would take the sprint race crown. But after mastering the waves all day, Fiona got caught up in the surf during the final and lost valuable ground as Terrene paddled clear. Though while the under-rated Aussie took a well-deserved win today, one of the most impressive performances of the entire event came from future champion Annie Reickert. The 15-year-old showed great local knowledge as well as competitive maturity well beyond her years to out-surf all the women in the final round (including catching the set of the day on the final leg into the beach), which saw her leapfrog Fiona and take the runner-up spot behind Terrene. The overall Maui Pro-Am event title will be decided tomorrow with a Maliko run, however it looks like the wind will be dead flat so we could be in for a real grind-fest instead of the usual downwinder. Sunday race won’t be webcast but you can watch a full replay of today’s entertaining livestream right here. Results below. Videos and photos coming soon. Follow @supracer on Instagram for more.